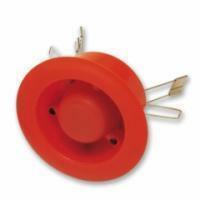 Fire hooter KS-F79CV is loud siren to promptly notify building occupants of fire hazards. Bright color design for visual notice. Caved-in design of this bell allows for easy ceiling mount installation and removal. The casing is sturdy and durable, made of high ensurance, solid and colorfast fire-resistant material.